Hi all, I am having to replace some 22mm copper pipe for my CH system which were buried under concrete. I was thinking about using JG Speedfit PEX, but I am wondering about whether the pipe inserts would cause some troublesome flow restriction, so wanted to ask you experts about it. The pipes are the immediate flow and return from the boiler, about 5m long with 2 radiators feeding from them, so the PEX pipe would have 6 inserts in it. Should I consider using 28mm PEX instead of the 22mm? I guess that you will probably need more information, so just let me know what you need. No, you will be ok with 22mm. Make sure you leave at least 1m copper off the boiler. If going back into concrete put them in the speedfit conduit. Thanks for the reply Dave. 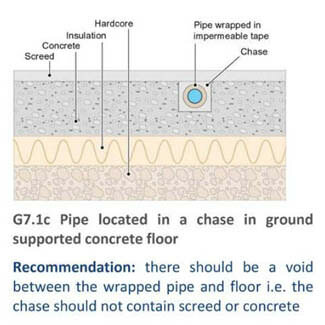 I had a quick read of the water regs/bylaws and it appears that burying pipe fittings is no longer allowed, so I was planning to create a "chase" in the concrete and cover the pipes and fittings with a thin layer of screed, like the pic below but the chase would be lower and the screed would only cover the pipes. As well as the plastic conduit for the pipes, would I need to protect the four tee fittings with something?